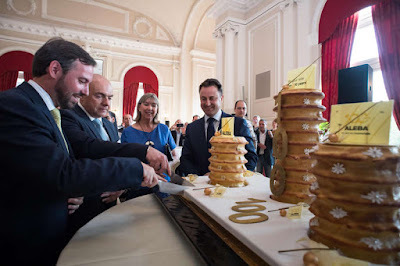 Yesterday, Hereditary Grand Duke Guillaume attended the festivities that took place on the occasion of the 100th anniversary of the Luxembourg Association of Banking and Insurance Employees (ALEBA). Prime Minister Xavier Bettel and Luxembourg mayor Lydie Polfer were in attendance too at the event at the Cercle Cité. More photos at the cour.